Pants can be categorized by their waist, shape, and type of pleats. This illustrated guide takes a deep dive into the many types of pant waists, lengths, and styles. Boy shorts have a square leg hemmed 1 to 1 1/2 inches below the crotch. They are also called short shorts or hot pants and are worn often within the entertainment industry especially as part of cheerleader costumes or for dancers. 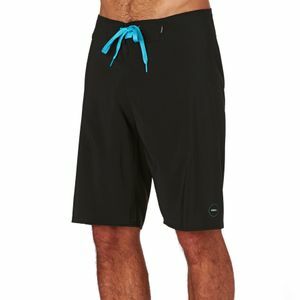 Jamaica shorts are mid-thigh length shorts between Bermuda and boy shorts. Jams are full-cut, elasticized waist, above-knee length shorts. 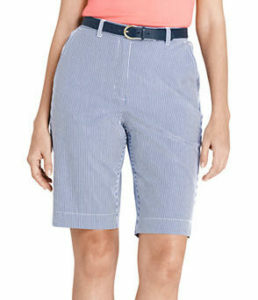 Bermuda shorts are a knee length short that fits closely. 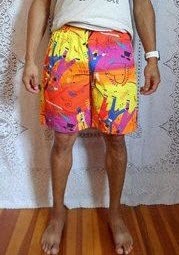 They are sometimes called walk shorts or dress shorts. Baggier versions with fuller pockets than a safari short are called cargo pants. Safari shorts are knee length or shorter ants with comfortable fullness and patch pockets. They may be cuffed. 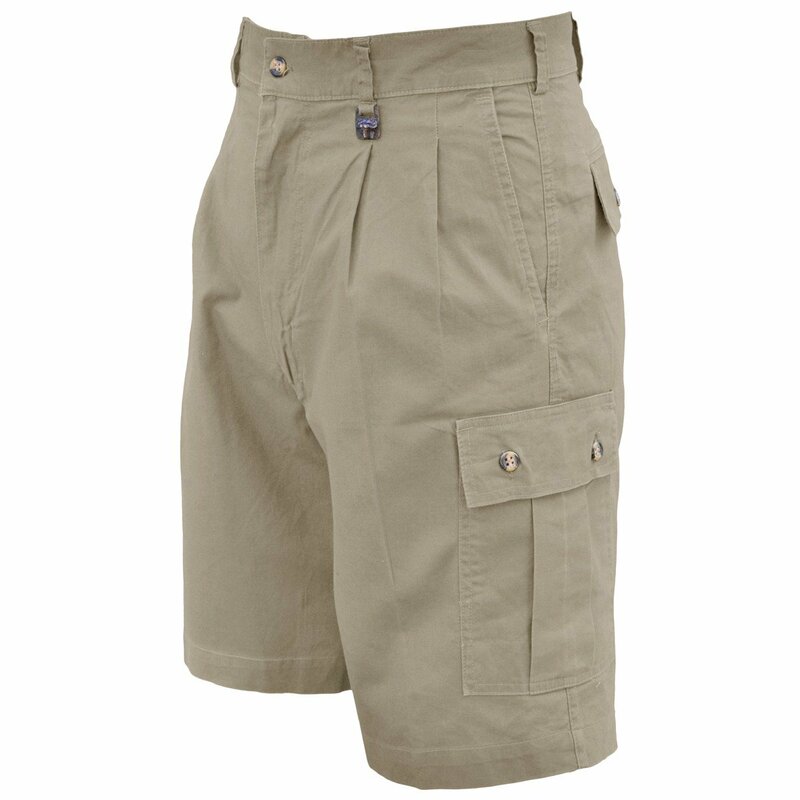 Versions with multiple larger/fuller pockets are called cargo shorts. 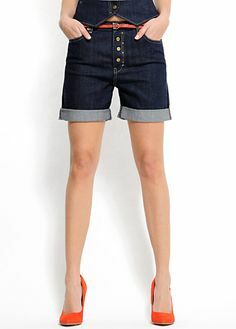 Walking shorts are knee-length pants with fullness from pleats or gathers. They may be cuffed. 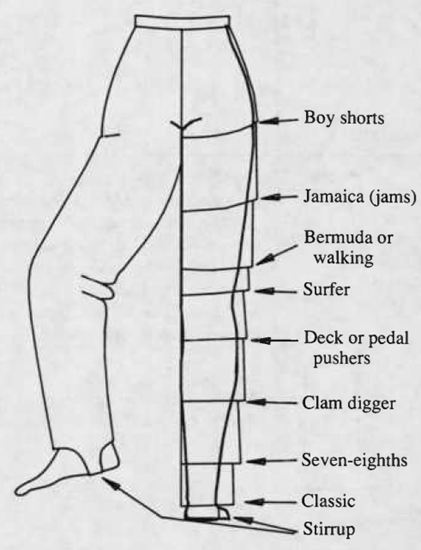 Surfers are tight-fitting pants that end at the knee. Deck pants are a fitted pant with a hem just below the knee. Straight-cut pants are called pedal pushers. Sometimes called Capri pants but generally Capri pants are technically a longer version. Clam digger pants are a mid-calf pant with a straight or fuller cut and cuffed. 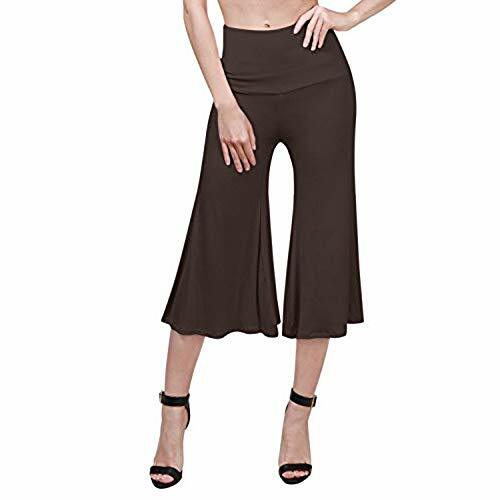 Gaucho pants are flared calf-length pants, frequently of leather or firm fabric. Cropped pants are cut at varying lengths between the ankle and knee. 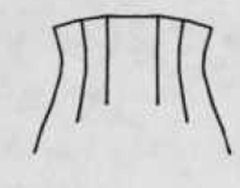 Seven-eighths pants are any style of pants coming to just below the calf of the leg. 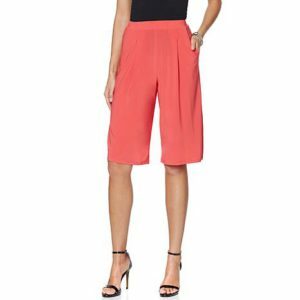 Capri pants are a slim-legged pant that ends several inches above the ankle. Classic pants are full-length pants, usually with a center front zipper closing and fitted at the waist with darts or pleats. They may also be referred to as trousers. Stirrup pants are a narrow pant that tapers to the ankle and comes with an extension worn under the foot like a stirrup. 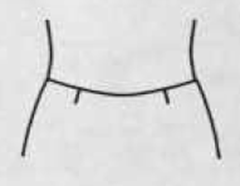 The stirrup, which is often elasticized, serves to hold the pant leg in place. The same design is often used in leggings. Ankle pants are a slim pant that are ankle length. The slim look comes from fitting or from knitted fabric. Baggies are a pant that are wide at the hip and narrow at the ankle. 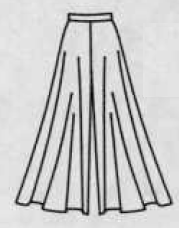 The width at the waist and hip may be from gathers or pleats. They are also referred to as peg leg pants or peg-top pants. Bell bottom pants are fitted at the wait and flare from the knee to the hemline on both the outer and inner seams. They are also called flare legs of flared pants. 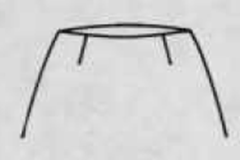 A variation with an exaggerated flare is called loon pants and a version with an even larger bell are called elephant bell pants. 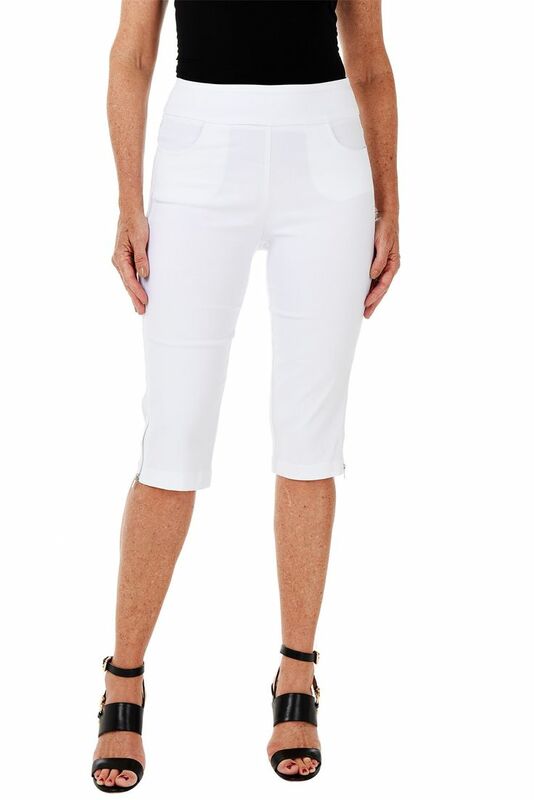 Variations exist with double-button front openings and lacing at the back waist called sailor pants. Bib or bip-tops are pants with a rectangular piece attached at the waist and held with shoulder straps. The bib piece may have pockets. They are also referred to as overalls, suspenders, or painter’s pants. Children’s versions of the pant are called crawlers. 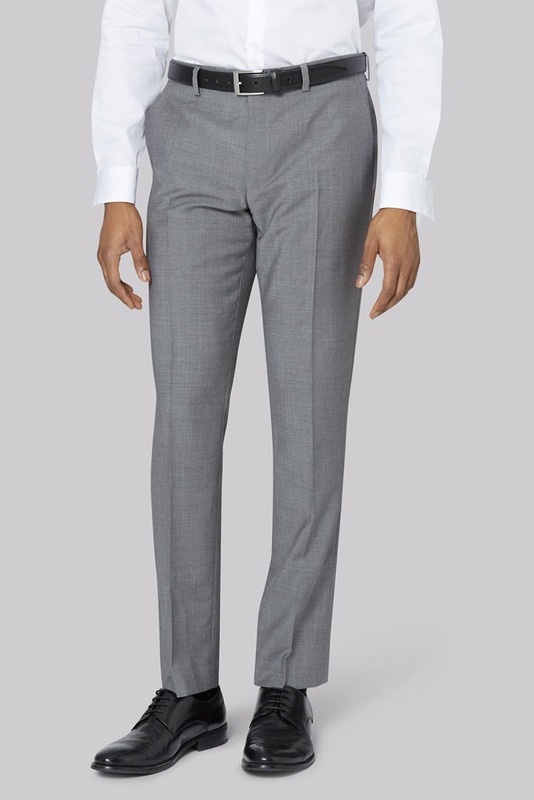 A boot-cut pant is a pant of jeans cut wide enough at the hem to be worn on the outside of western boots. Harem pants are very full pants gathered at the waist and ankle. They are also called shalwar pants. The knee length are called Zouave pants. Jeans are close-fitting pants with western pockets in front, yoke, and patch pockets on the back. They are typically made of denim. They may also be called dungarees, blue jeans, Levis, Wranglers, or other brand names. Jodhpurs are a riding pant with a drop front or zipper closing, rounded flat at the thighs, and narrow legs straight-cut below the knee. 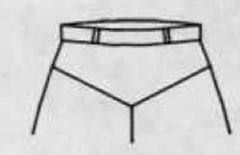 Variations of the pant include hunt breeches or riding breeches. A jumpsuit is a combination of pants and shirt or blouse in one piece. Knickers are a tailored knee-length pant with fullness gathered into a band just below the knee. They are sometimes called knickerbockers. Palazzo are a long-length pant with a very wide flare from hipline to hemline. Parachute pants are pants with a zipper on the outside of the legs from hem up to mid-calf to give a tight fit at the ankles. Zippered pockets may be placed at the side of the leg and on the hips. Straight pants are a slim-legged pant with a circumference of leg hem less than 18 inches. They are also called stovepipe pants (shop straight pant styles). 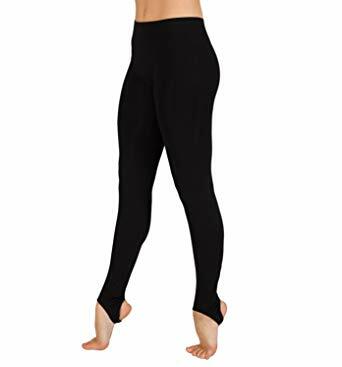 Stretch pants are a tight-fitting pant made from knitted stretch fabric. They may be held in place by a stirrup (shop stretch pant styles). Tapered pants are an ankle-length pant that become narrower near the hem. Toreador pants are a tight-fitting pant that ends just below the knee and usually has braid trim down the sides. Western pants are low-waisted slim pants with jeans-style fitting and pockets.